A hearty salad, served warm - perfect for chilly winter days! Serves 4-6, depending how hungry you are. Cook the pearl barley according to the pack instructions. Once cooked, set aside. Toss the beetroot pieces with salt, pepper and olive oil, and roast for about 25 minutes. Once cooked (you can prick them with a fork), set aside. Rinse the lentils, and put them in a pan with plenty of water, the bay leaf, and halved onion. Cook for the length of time indicated on the packet. Once cooked, removed and discard the onion and bay leaf. Drain the lentils and set aside. Meanwhile, roast the walnuts in a dry frying pan. Watch them carefully as they burn very quickly! Once they're cooked and cool enough to handle, put them in a plastic bag and whack them with a rolling pin to break them up into small pieces. 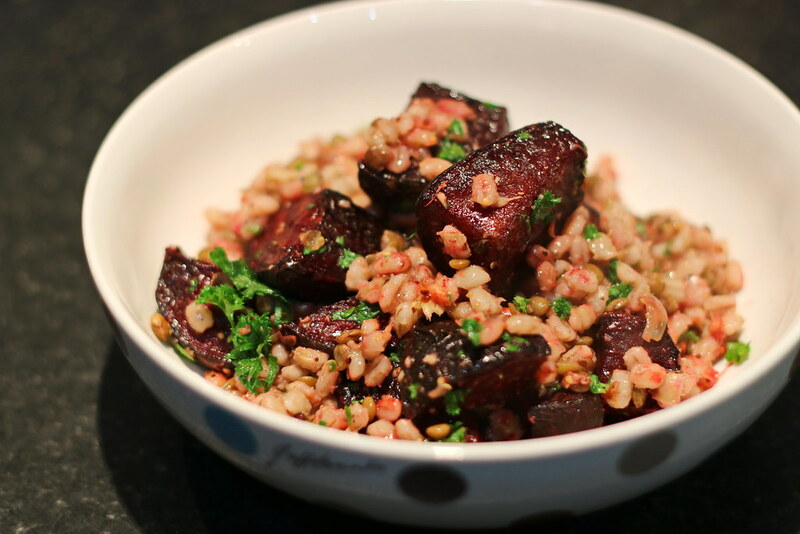 Assemble the salad by mixing together the pearl barley, roast beetroot, lentils, walnuts and parsley. Pour the dressing over, stir to combine. Adjust seasoning to taste. Enjoy straight away at room temperature. This salad also packs into Tupperware for lunches if you have any leftovers. It stores well in the fridge for a few days.